The member requested that his identity be not disclosed because “I fear based on the behaviour and decorum at the SGM some sort of harassment from certain members” that were present at the SGM. Their Vexatious behaviour was too visible to be ignored. For that reason, Alameen Post has decided not to include the member’s complaint in full rather just the receipt and proof of his complaint along with possible consequences below. “My experience and the experience of many BCMA membership can be summarised in one sentence -BCMA record keeping has taken a back seat among other priorities. I have heard from many members that this is not something out of the ordinary; rather it happens all too often in all elections and special meetings. BCMA has failed to keep a register of its members updated far too many times to be forgiven. It is time perhaps the membership should start asking questions and report it too the federal and provincial agencies. We the membership often forget, forgive, and move on but the problem persists. Year after year, election after election and NO one Dares to speak, if you do so you become a target. A group of individuals, who were present in this SGM held on November 11th, came and misbehaved like a pack of wolves; made personal attacks on individuals who were just doing their job. I must admit that my membership was not renewed because of these individuals. They were in the management of BCMA in 2017, they failed to update my membership and I bet they will blame everyone else for their incompetence judging by their behavior. 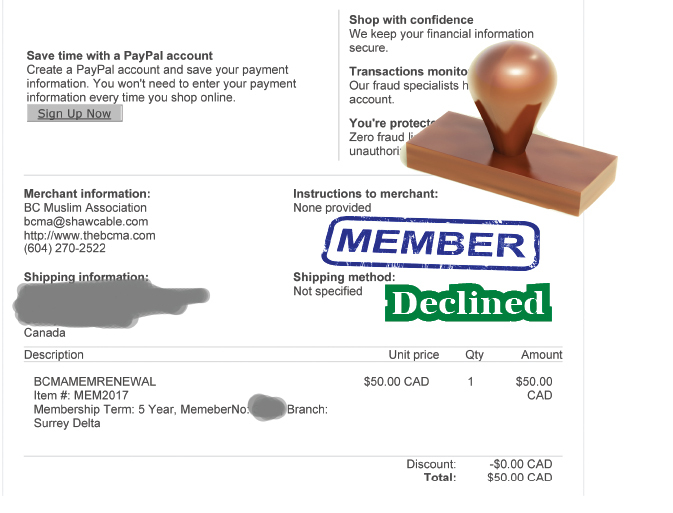 I had renewed my membership online and thank GOD I had my invoice from PayPal in my email, see attached as proof of payment. When I did go to vote last year at Surrey masjid the same thing happened and they said your membership had expired. Knowing the experience of BCMA employees, I did take my invoice and gave it to them so I could vote. I had assumed that after one year they would have kept the records up-to-date and so I did not take my receipt. To my dismay, I was disgusted that my record was not updated. I was told I could not vote. And I did not. Why should I go back home to get my receipt and then come back again. Something needs to be done about this. The BCMA constitution states it is the responsibility of the membership committee, then why are employees managing the membership list. At least that is what I understand, last year employees managed the list and this year I have been told the General Secretary manages the list. When the membership committee manages the membership list, it is supposed to be independent of the employees and those in powers so that this kind of things do not happen. After 51 years BCMA still cannot manage their membership it tells you more about the individuals running the organizations. Because of the actions of few people many have left BCMA. Just take a look around. How many organizations have started to serve the community and many more will be established and BCMA will loose its once cherished credibility. I urge Alameen Post to write about these hot emerging issues of Muslim organizations and the individuals who operate them and their incompetence so that people are aware of these individuals who are doing a disservice to the community. Also, please ask BCMA to respond on these concerns and print them in Alameen Post for the readership. Alameen Post did send the concerns to the General Secretary with ample time to respond. The message was sent on November-19-18 1:29 PM. and again at 7.15 p.m. Till Wednesday Novemeber 28, our press time we have not received any clarifications from BCMA.